They also put on police chiefs who talked up increased violence due to guns but never made an reference to John Lott’s More Guns, Less Crime. They just tried to say that large city’s will be less safe if the bill passes . Pushing states that do not require the “training” will allow people to carry firearms in city’s like New York when their own people can’t. They claim that law enforcement is against this bill and had some law enforcement saying it will make people less safe. It certainly was not on our side . I made sure I changed the channel as soon as it was over .. I didn’t want to help their ratings anymore than I had to . Did anyone really expect anything less that a Left-Wing presentation from CBS 60 Minutes, on the Constitutional Concealed Carry Reciprocity Act of 2017-18? This wasn't an interview. It was a Left-Wing idealogy piece. In a true interview you ask the guest questions to bring light and truth to the subject. So why did the moderator do most of the talking(lecturing)? Same old tired Left-Wing blather. Why would we expect more? I can always dream, but I expected it to be anti-gun all the way through. Interesting pair of articles from CCW Safe and Legal Heat . In the first article the author points out , HR 38 will allow carry in States where that State issues concealed carry licenses. But States such as NJ, MD, NY, and HI could just eliminate concealed carry altogether or tighten up the laws to make carry unfeasible. The Legal Heat articles distinguishes between “keep arms” (which Supreme Court has ruled as constitutional) from “bear arms” (which SCOTUS has not yet ruled on). “Bear arms” is a state issue which fortunately for us, Delaware has done. California, Iowa, Maryland, Minnesota, New Jersey, New York have not. Section 20. A person has the right to keep and bear arms for the defense of self, family, home and State, and for hunting and recreational use. Senate Bill 446 (the Senate version of HR38) makes a small step forward. Judiciary hearing started 3/14/2018. I doubt whether even the antis on SCOTUS would go along with NY banning CC since they already ban OC, and thus would effectively ban the Right to Bear Arms entirely. Practically, that is also true for the vast majority of CA residents as well. "Bear Arms" is currently only protected at the state level, that is true. That is also why those 6 states without a state constitutional RKBA are where the federal Bear Arms cases will arise that will one day, if Trump gets to replace either Kennedy or an anti, be taken by SCOTUS and give us ALL a federal Constitutionally protected right to Bear Arms. The Senate version of the National Concealed Carry Reciprocity Act of 2017, S.446, has just got it's 40th co-sponsor signed on. Unfortunately, one gets the feeling that S.446 will need 59 co-sponsors and 1 sponsor to move past Mitch McConnell. This is something Trump said he is for and would sign if passed in the House and Senate. So, since Mitch McConnell is a "Never Trumper", It will likely not ever get to Trump. McConnell is the "Gate Keeper of the Senate, nothing gets in, nothing get out unless he ok's it. Ok, listen up. Republicans have the US house, the US Senate, The Presidency, and now the conservative control of the SCOTUS, right? So when are we going to get National Concealed Carry Reciprocity? If we get that, screw PA. and the other states. We won't need their permits, we'll save money, and gas running around trying to get other states permits. Now is when we need to get on the Republicans and especially Mitch McConnell, to bring a Bill to the floor and pass it. Trump has said from the get go he will sign it into law, and now we can be confident that the SCOTUS will back it. I sent an email to Senator John Cornyn of Texas. He and Rep Hudson were the originators of the House and Senate bills last year. Let you know what they say. I don’t understand a lot of this stuff. Now is the time to move on it — because there is no later. If the thought is that things will settle down and they’ll be able to act on it, that’s just crazy. There will be another shooting, another stabbing, another truck used to drive over someone — anything that can be used as a reason why such a law would be unreasonable and dangerous. If not now — then when? As I've said, Mitch McConnell is the gate keeper to the bills that get to the Senate floor. The bill has been voted on and passed by the US House, it has the backing of the NRA, I has already been said by President Donald Trump, that he will sign if passed by the US Senate. McConnell is blocking the bill for some unknown reason. The bill had 213 co-sponsors in the House, including a couple of Democrats. The Senate version(S 446) in in the Senate Judiciary committee (headed by (R)Chuck Grassley) and has 40 co-sponsors. My latest research shows that US Senate Bill S.446 will die in the Senate Judiciary Committee, who is under the control of Sen. Grassley. There has ben no action of hearings on it for a year and a half and for all practical purpose it is "dead in the water". I had 40 co-sponsors and if at least 11 others voted for it, it never had a chance of getting passed and signed into law. 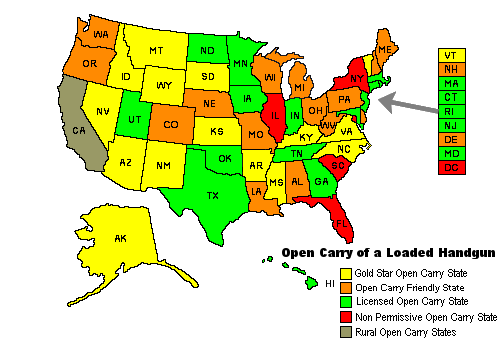 As things look now, unless some one else takes up the torch of freedom of concealed carry reciprocity, it just ain't going to happen, maybe ever. What we need to focus on is keeping the rights we already have, because they (the Left)are coming after them hard, and it seems the right doesn't have much guts.